& Instructors Whose Hard Work & Dedication Today Creates the Heroes of Tomorrow. Remove the headache of finding the right gift at the right time. Mission Accomplished. We Ship Worldwide Since 1996 - Premium Quality... Great Price... Guaranteed! 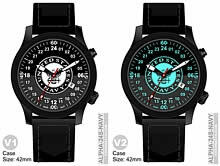 An authentic, high quality 24 Hour Dial Military watch with back light will be cherished 24 Hours a Day -- 7 Days a Week -- for Years. Looking for that memorable Gift that shows with Quality and Style your true Appreciation for those whose dedication & achievement makes the difference? Ready to celebrate a successful mission or milestone achieved in a big way? 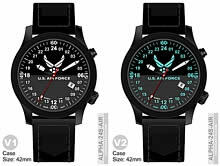 Look no further than a unique 24-Hour Dial Watch that promotes, rewards and inspires loyalty at home & in the field 24 hours a day. A Gift like no other that will be cherished and worn with pride... Every Day. 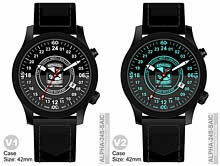 Rugged, IP Black Stainless-Steel 10 ATM Military Award Logo Watch with Backlight Collection - Available from 25 pieces. Promote your military Branch, Police & Fire Departments, your School or Academy while inspiring loyalty. Show your dedicated men & women that you appreciate their Service. Acknowledge your support for those whose hard work & dedication to duty goes above and beyond. © Copyright 1999 by Fotowatch. All rights reserved.